'Cliburn Weigh Office', Cliburn, Nr Penrith, Cumbria, England. In the beautiful Eden Valley, within Easy Reach Of The Lake District National Park. 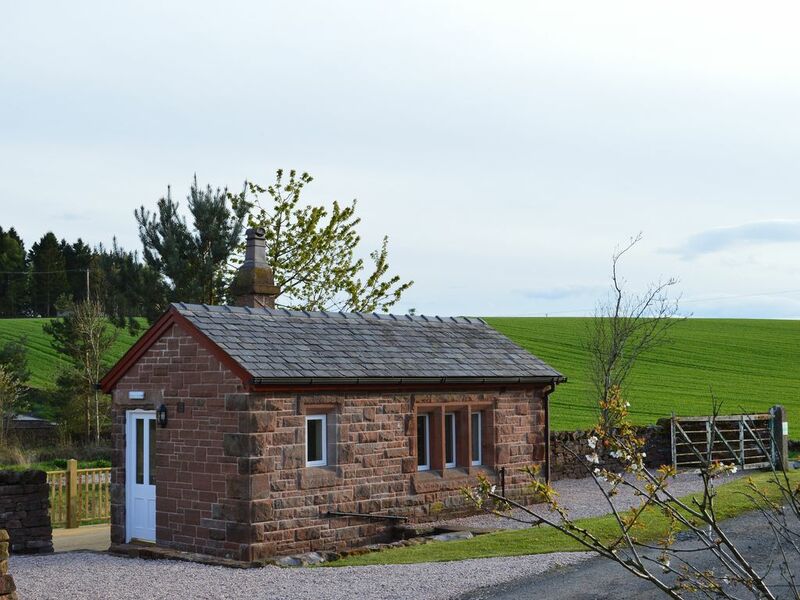 Cliburn Weigh Office is a compact luxury holiday cottage. Once a working part of the Eden Valley Railway line, the Weigh Office nestles at the bottom of Whinfell Forest, between the market towns of Penrith and Appleby, in the beautiful (but often forgotten) Eden Valley. Located in beautiful countryside the Weigh Office provides the perfect base to totally relax and join with nature. With private parking, gravelled areas and decking overlooking (and having access to) a private 14 acre wood, this is a perfect get away to relax, enjoy, explore and stargaze. We moved into the property on 1st October 2004, leaving city life behind, in search of a more peaceful and fulfilling life, for both ourselves and our two children, Elliott and Jasmine. Gavin, born in Northern Ireland, left Limavady in 1987 to study at Bradford University. There he qualified as a Pharmacist in 1991 and is the Pharmacy Manager at Sainsbury's Penrith. Wendy, born in Tyldesley, Manchester left in 1989 to study at Bradford University. There she qualified as a Pharmacist in 1994 and is now the Pharmacy Manager at Green Tree Pharmacy, Kirkby Stephen. Whilst working in Leeds, we met in 1992 and married 25th August 1996. In July 1999 Elliott was born and in February 2002 Jasmine was born. It was at this point we decided to leave the city life behind and moved to Cliburn. Wendy and I fell in love with both the location and character of the building when we first saw it. We loved it so much we live in the Station House beside the Weigh Office and decided to renovate it, so others could enjoy it as much as us. We have just finished the renovations in May 2015. We live beside the Weigh Office all year round and often forget just how lucky we are to live here. To us peace, tranquility and seclusion are the norm. We step outside our back door into beautiful countryside and a 50m walk has us strolling in Whinfell Forest, where we regularly see the local red squirrels, roe deer, owls, buzzards, pheasants, great crested newts and an abundance of other wildlife. At night little light pollution means that we can stargaze and if that wasn't enough, a short drive and we are walking up one of the many fells or playing in one of the lakes. What more could you ask for? Bathroom (ground floor) - shower, toilet, sink, mirror and shaver socket. Underfloor heating, powered by an eco friendly groundsource heat pump, warms the floor in the kitchen, lounge and bathroom. Double duvet, double sheet and four pillows provided. The property does not have a washing machine, but use of the owner's washing machine is available, at additional cost. We have a large secure barn, which can be used to store bikes etc. if required. Wifi available using secure code, provided along with arrival details once payment has been received. Please be aware that the system can be a little slow & temperamental due to delivery & location. Two hand towels and two bath towels provided. Small wood-burning stove, with an amount of wood provided for during your stay. Lounge (Ground floor) - twin sofa, wardrobe & drawers, 40" TV, freeSAT, DVD/CD player and cosy wood burning stove. Larder fridge provided in the kitchen. Use of the owners freezer is available if required, at no extra cost. Due to the limited space in the Weigh Office, dining is in the lounge using folding tables. Radio with docking station located in the lounge. Private garden with gravelled areas. Decking area overlooking 14 acre wood, with wooden garden furniture for two. Penrith Golf Club - 9.5miles A Cumbrian golf course situated in a splendid location between the world renowned Lake District and the delightful Eden Valley. The Lakeland fells provide a magnificent backdrop to this par 69 course formed in 1890. Appleby Golf Club - 11miles Appleby Golf Club is situated two miles east of the town centre just off the A66. The club enjoys a golfing history dating back to 1894 when the game was played on the Minsceugh just outside the town. In 1903 the club was reformed on its present location on the Brackenber Moor. The Open Champion Willie Fernie of Troon laid out the course using the natural contours of the moor with short heathery rough and bracken to provide a challenging and spectacular course described as "Gleneagles in the raw". His creation is undeniably testing, as the 5998-yard par 68 (SSS 70) course contains no par 5's but some long challenging par 4's. Due to the nature of the property (having steps)and the sleeping quarters (accessed via a ladder), it is with regret that we list this property as wheelchair inaccessible. Notes on accommodation: The Weigh Office uses an eco-friendly ground source heat pump to provide under-floor heating to all of the rooms. Outside: The private garden has gravelled areas, large decking platform (with views over and access to a private 14 acre wood), barbeque, garden furniture and parking for one car. Cleaning / Towels / Linen / Maid service: Linen & towels are provided and are included in the price. Both will be exchanged on a weekly basis. Cleaning is not provided. Other: Secure storage and wash facilities for bicycles are available upon request at no extra charge. So glad you enjoyed your stay. Thanks for being great guests and we hope to see you again in the future. My second stay at the Weigh Office and it was every bit as good as before. It is a stand-alone building in a very peaceful position with its own parking right next to the front door. Inside it is compact but with everything one could need. The place is newly refurbished and pristine. And, the situation is perfect - at the gateway to the Lakes and wooded walks on the doorstep. Great value for money. Indeed, for the price, couldn't be better. Thank you for another glowing review. Great to see you return and we hope to see you again in the near future. Great place to get away from the city and enjoy peace and quiet in relaxing surroundings.Plenty of things to do walks,castles etc. Thanks for your review and we are so pleased the Weigh Office was a suitable base for you to relax in the peace and quiet. We would love to welcome you back in the future. Owner very welcoming, very friendly. On arrival we had a bottle of wine and biscuits which we appreciate very much. The little house as many people on reviews have said... it is definitely a very special place, uniquely well built, a place who made our wedding anniversary more special. We agreed...definitely a place to comeback. Lovely to hear you enjoyed your stay and that you made it part of your anniversary. Thanks for being such great guests and we would love to welcome you back. We are so pleased you enjoyed your stay and we loved having you as guests. Thank you for your review and we hope to see you again in the future. So pleased you loved the Weigh Office and were able to use it as a suitable base for your trips. It's amazing what you can fit in a small space. Selection of golf courses, Appleby or Penrith. Fly fishing at Blencarn Lake. Perfect setting for a walking, running or a cycling holiday. Or even an open water swim / triathlon! A car is recommended because of The Weigh Office's secluded location. The market towns of Appleby and Penrith are only seven miles away and provide all the required local amenities. Whilst there are many local pubs serving traditional beers and serving fine food in the area. The Signal Box is a perfect base for those wanting to explore the Lake District National Park. With Pooley Bridge only 9.5miles away and Blencathra only 19miles away. Booking Notes: Bookings can be made over the phone or by email. A non-refundable 25% deposit is required to confirm any booking. A refundable £100 good housekeeping bond is required. This will be used to cover any breakages, damage or excessive cleaning that may be caused during your stay. All bookings must be fully paid for (including refundable bond) four weeks prior to arrival. Arrival is after 4pm and departure by 10.30am. Minimum Stay: Minimum stay of three nights applies to all stays, but do contact us if you require a shorter stay. Changeover Days: Prices are based on our Change Over Days being a Friday or a Monday, giving the option of weekly, weekend or midweek breaks. Although Change Over Days are not fixed, there may be additional charges if the guest wishes to arrive on days other than a Friday or a Monday. Please contact Gavin or Wendy to discuss alternative change over days, options and rates. Notes on prices: Prices are for TWO people sharing the double bed. Stays of a week or longer will be priced using the Seven Day price, while stays of between three and seven days will be priced upon request.